The Big 5 Saudi is returning to the Jeddah Centre for Forums & Events from 10 – 13 March 2019 with a record number of free workshops, product sectors and official country pavilions. An ideal platform for construction industry professionals to network, secure qualified leads and close business deals in the largest and most populous GCC country, the exhibition is expected to attract 15,000 visitors, hosting over 300 manufacturers of construction products from around the world. Marking a growing international participation, the event will feature for the first time official country pavilions from Egypt and Pakistan, alongside Germany, Italy, Spain, Greece, India, Turkey and China, among others. More than 100 top Saudi construction players will also exhibit at The Big 5 Saudi 2019, displaying the latest technologies and building solutions across eight dedicated product sectors. Beyond the traditional MEP Services, Building Interiors & Finishes, Construction Tools & Building Services, Building Envelope & Special Construction, in fact, The Big 5 Saudi 2019 will introduce the all new Heavy Equipment, HVACR Equipment, Smart City Technology, Solar Equipment, and Urban Design & Landscaping Equipment zones. At the event, the Saudi Standards, Metrology and Quality Organization (SASO), the Saudi Building Code National Committee (SBCNC), and the GCC Standardization Organization (GSO) will provide crucial intelligence to local and international participants, paving the way for the future development of the Saudi construction industry. Alongside the exhibition, The Big 5 Saudi 2019 will also offer more than 80 CPD (Continuing Professional Development) certified and free to attend workshops, a 48% increase year on year. Delivered by renowned industry experts, the educational sessions will focus on four major themes: General Construction, Project Management, Sustainability, and Architecture & Design. Today, Saudi Arabia’s construction sector is in the spotlight following news of mega-urban developments such as NEOM and The Red Sea Tourism Project, as well as social reforms that welcome a fresh commercial entertainment industry. More than 5,200 construction projects are currently rolling out in the Kingdom. Valued at USD 819 billion, these account for 35% of the total value of active projects across the GCC. El Haddad says: “The construction sector’s immediate outlook is extremely promising. The launch of the Public Investment Fund backed multi-billion dollar Amaala resort in 2018, as well as the already announced NEOM and Red Sea Project, is a proof of that. “Saudi Arabia’s Vision 2030, along with significant investment in housing and infrastructure development promoted across the country by local authorities, are revitalizing the construction industry and generating interest in a growing number of international players,” El Haddad concludes. The Big 5 Saudi 2019 is supported by Al Fouzan Trading & General Construction Co. (Gold Sponsor), Astrolabs (Entrepreneurship Partner), The Saudi Standards, Metrology and Quality Organization (SASO), the Saudi Building Code National Committee (SBCNC), the GCC Standardization Organization (GSO), and the Jeddah Chamber of Commerce. 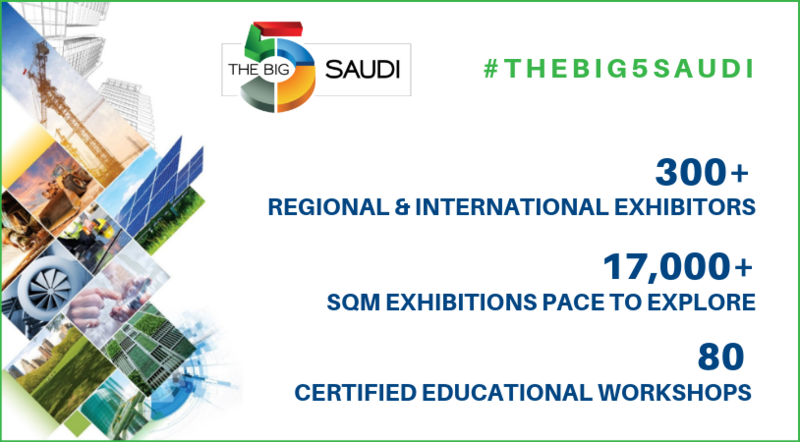 Organised by dmg events, the ninth edition of The Big 5 Saudi will take place from 10-13 March at the Jeddah Centre for Forums & Events. To know more about The Big 5 Saudi, www.thebig5saudi.com. For latest press releases and show info: https://press.thebig5saudi.com/.